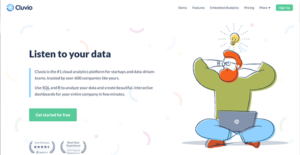 Founded in 2015, Cluvio is an SaaS business intelligence solution that employs both SQL and R to help organizations of any size make the most of data and extract information otherwise just lying unused in their systems. The deep insights gained through the application inform decision makers the decisive courses of action that they need to embark on in order to propel their organization to success in today’s hyper-competitive world. The application incorporates all the modern technologies in terms of intuitive user interface design, powerful dashboards, and the strongest security protocols to ensure your data is right where it should be rather than falling into the wrong hands. The first order of business intelligence tools deals with data, and current realities tell us that you cannot have data in poorly secured installations if you don’t want someone else making the most of your data before you can even begin to contemplate of any use for it. Consequently, Cluvio has taken inspiration from the toughest security measures seen among banking institutions. The result is security that equals or exceeds some of the most robust protocols around along with the physical insurance provided by vigilant auditing and monitoring of anything that is crucial to the integrity of your data. SQL and R running under the hood to find hidden connection amongst your data stockpile means you get critical insights in the shortest time possible. Just as flight pilots take command of their planes via cockpits that control just about everything in-flight, so you can fly amongst multiple functionalities via your cockpit-inspired dashboards. What Problems Will Cluvio Solve? The main advantage of Cluvio is that it enables agile analytics. While many traditional BI products require dedicated teams and lots of time spent on preprocessing data and the creation of a logical model, connecting a data source, creating a dashboard and writing the first queries in Cluvio all happens within a matter of minutes. Also, as reports are based on SQL, it becomes easy to re-use existing queries and quickly create charts based on them. Cluvio is all about sharing analytics within a team to make everyone benefit from it. Users can either “publish” a dashboard, which gives all colleagues access, or, to share with external users, create a unique and secure URL that allows everyone with the link to access the dashboard without needing a Cluvio account. Writing complex SQL queries can be hard. The Cluvio SQL editor is a great help, as it supports syntax highlighting, auto formatting, context-dependent auto-suggestions and much more. It also allows to quickly run queries in parallel to writing the main query, which enables users to easily explore their data while working on a query. If you are considering Cluvio it may also be a good idea to investigate other subcategories of Best Business Intelligence Software collected in our base of SaaS software reviews. Since each enterprise has particular business requirements, it is prudent for them to desist from searching for a one-size-fits-all ideal software system. Needless to say, it would be futile to try to find such a platform even among popular software solutions. The smart thing to do would be to jot down the various vital factors that require consideration such as key features, finances, skill levels of workers, company size etc. Then, you should do your groundwork thoroughly. Read some Cluvio reviews and look into each of the other solutions in your shortlist in detail. Such in-depth research can make sure you reject ill-fitting applications and choose the solution that provides all the aspects you require for business success. We realize that when you make a decision to buy Business Intelligence Software it’s important not only to see how experts evaluate it in their reviews, but also to find out if the real people and companies that buy it are actually satisfied with the product. That’s why we’ve created our behavior-based Customer Satisfaction Algorithm™ that gathers customer reviews, comments and Cluvio reviews across a wide range of social media sites. The data is then presented in an easy to digest form showing how many people had positive and negative experience with Cluvio. With that information at hand you should be equipped to make an informed buying decision that you won’t regret. What are Cluvio pricing details? What integrations are available for Cluvio? If you need more information about Cluvio or you simply have a question let us know what you need and we’ll forward your request directly to the vendor.